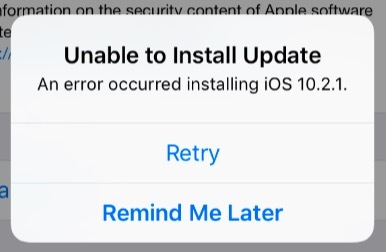 Several users have reported that they’re receiving an error when trying to update their iPad or iPhone devices. It seems that this is one of the most common issues that iOS users face when updating. You can easily update your iPhone, iPad, or iPod touch wirelessly. To install the latest version of iOS, tap Settings > General > Software Update. If you can’t, there might be many possible reasons. Apple periodically releases updates for the iPhone, iPad, and iPod touch. Updates for iOS are released via over-the-air software updates. These releases include bug fixes, additional features and improvements. Thus we recommend to install the latest available updates. Make sure that there is enough space to download and install an update. If this is the issue, you may want to make more space by removing content that you do not need or use. To do so, simply go to Settings > General > Storage & iCloud Usage > Manage Storage. You may also want to turn on iCloud Photo Library. This will let you reduce the size of your Photo library. Now Settings > General > Software Update and try again. Connect your iPad or iPhone to your computer using your USB to Lightning (or 30-pin Dock) cable. iPhone 7 and newer: Simply press and hold both the Sleep/Wake and Volume Down buttons until the Apple logo appears. iPhone 6s and earlier models and other iOS devices: Press and hold both the Sleep/Wake and Home buttons until the Apple logo appears. On your computer, download IPSW file for your device. Hold down the Shift key in Windows or Alt/Option key on Mac and click Update.